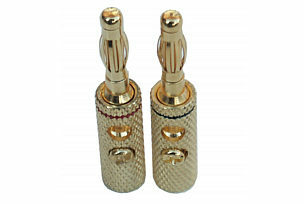 All metal 4mm banana plug, gold plated with black/red indicator band. The plugs feature screw termination for cables up to 5mm diameter. Also features a through hole which accepts another 4mm banana plug. Speaker Cable 15m, 2 x 0.4mm OFC with transparent jacket Length 15m, supplied on plastic drum for easy unwinding. Multi-strand Oxygen Free Copper cable. Red stripe for polarity identification when wiring. Transparent jacket. 0.4mm squared copper cross section per conductor (21 AWG).